In my earlier posting “Wooden Week” I mentioned how loud woodcase pencils were. I received some feedback on this statement that has prompted me to do a little thinking. So just when you thought it was safe, that pencil geek nerdiness could go no further………. Now I’m no acoustics expert, and I haven’t gone out and hired an expensive sound level meter, oscilloscope and other equipment to conduct this investigation. I am instead relying on my two head mounted listening flaps. My comment that woodcase leads were noisy was based on writing with the HB grade pencils of Wooden Week in comparison to a couple of mechanical pencils. To my ears there is just no contest, woodcase pencil leads are really noisy, but noise and loudness, good or bad, are subjective things. As Woodchuck commented, “Of course the sound of the pencil is also part of it's charm”. But then there is also a saying about one mans quiet mellow easy listening music being my neighbours deafening punk rock nightmare. So is there any logical reason why mechanical pencil lead should sound different to, and possibly be quieter than woodcase pencil lead? I think the answer is yes. Mechanical and woodcase pencil leads are not quite the same substance, as they are made from different raw materials. Manufacturers regard the finer details of their lead compositions as trade secrets so this is just general basic level information. Normal pencil lead is a “ceramic” lead - primarily a mixture of graphite, clay and grease/wax. The graphite marks the paper and the clay is the binder that holds the mixture together. This composition does not have the strength to withstand the demands of thin lead mechanical pencils in the typical 0.3 to 0.9mm diameter range. These thin mechanical pencil leads are “polymer” leads - the mixture is graphite (and possibly carbon black) to mark the paper, and a polymer replaces the clay as the binding agent and oil sometimes replaces the grease/wax. Graphite and Carbon Black are both basically different forms of the same thing, i.e. carbon. “Carbon Black” seems to be used to distinguish very fine carbon black particles from larger “Graphite” particles. I don’t know exactly what type of polymer is used as the binder. Whenever I see “polymer” I immediately think “plastic”, which is what some manufacturers imply with wording like “synthetic resin” or “carbon skeleton”, but one manufacturer is a little more specific, using the wording “high polymer on the base of a natural material” and then talking about carbon fibre strands from a cellulose (plant matter) base. Of course many plastics are made from “natural” materials, like the celluloids (from plant matter) and casein (from milk) as opposed to “unnatural” materials like petrochemicals. I often look at the buttons on an expensive suit and consider how they started out as cows milk. Anyway it doesn’t really matter what the polymer is – the point is that the binder is not clay. Since woodcase and mechanical pencil leads are not the same substance, it’s obviously possible that they sound different. I could also imagine other factors like the size of the graphite and the clay particles, and their proportions in the mixture having an impact on the sound of the lead. Soft grades like 6B and 4B would sound different to hard grades like 4H. I tested some Staedtler Mars Lumographs in these grades and could hear a big difference. On some smooth papers the 6B & 4B woodcase pencils were silent while the 4H was still quite “scratchy” sounding. There are also other possible reasons for noise difference. Only a very short length of a mechanical pencil lead is held by the pencil mechanism, and the rest of the lead is enclosed within, but not attached to, the mechanical pencil body. So it’s inside a (possibly) sound insulating container. This arrangement could also limit the pencil body resonating the noise of the lead. On the other hand, woodcase leads are specially bonded to the wood along their entire length so the whole pencil could vibrate and radiate the sound. This would also imply a possible sound change as the pencil was sharpened and got shorter. Also of course how hard you push the lead into the paper could have a volume effect. And then there’s possible volume effects from the type and coarseness of the paper, the desk underneath….. This is all getting a bit complicated, I’m sure there is a Masters or PhD thesis in all of this! Alatavista and other search engines bring up some serious research involving breaking pencils and leads. It seems ill-treating pencils in the name of science is ethically acceptable. If you are crazy you can check out this foray into the diamagnetic properties of mechanical pencil leads! It actually raises even more questions about quality control and noise variations. I would like to thank “Steve” and an anonymous correspondent for their thoughts and suggestions on this subject. I think I need to seriously consider the state of my mental health, so I’m off now to watch rugby, gnaw on tough charred half-raw BBQ steak and drink beer - got to try and get rid of that pencil nerd! With mechanical pencils, it is relatively easy to study the effect of varying one parameter: I tried feeding the selfsame .7mm lead into different mechs (Bic < Pentel Planetz < Pentel EZ#2 < Sakura SumoGrip) and the noise was different. The wider and heavier the pencil, the quieter it was, for the identical stick of lead... The velvety glide of the SumoGrip is to be experienced to be believed, and it is heartening to note that it has nothing to do with choice of lead. Indeed, you could try rotating your pad and pencil around a horizontal axis while you're writing, and you can hear the noise of the wider/heavier pencil increase to that of the thinner/lighter ones as you start writing upward, against gravity (when presumably the effect is all due to the lead and not due to the pencil weight). Yes, one can let one's inner pencil nerd out a little too often..... I personally have people completely fooled. In the course of this investigation I did start to correlate increased mechanical pencil noisiness with lighter-weight plastic designs, and with sleeve type. Could anybody give me a pointer to the equipment used to manufacture mechanical pencil leads? I've got a project that could benefit from this information. Do you (or anyone else) know what the "lead" is in the 7B and 8B staedtler mars lumograph woodcase pencils? The rest of the grades of the lumographs is apparently normal graphite, but 7B and 8B are a rich black. And, unlike with graphite pencils, their marks do not get shiny, somewhat like charcoal (but I don't think it's charcoal). I can't find anything about it on the net. Conrad, Staedtler Germany HQ customer services are usually very helpful with all manner of inquiries so you might try them. 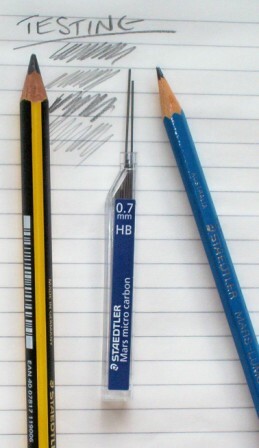 Also over at Pencil Talk (see sidebar link) there is a reasonably recent posting on the Staedtler EE & EB - &B & 8B. I know what you mean - they do seem to change composition in 7B and 8B. I think it is important to consider the acoustic properties of the writing implement. Wood is a much better acoustic amplifier than plastic. When you write, you are essentially introducing an infinite number of frequencies into the pencil, and the pencil then 'chooses' which frequencies it will amplify based on its composition. This is resonance. Since plastic is a worse amplifier, it will resonate fewer frequencies and it will be quieter than wood. About the lead: the softer leads will absorb more energy when marking and they also require less energy to mark. The harder leads don't absorb as much energy, and that energy is transmitted into the pencil and released in the form of sound. The absorption of energy of the softer leads manifests in the breaking of bonds in the lead resulting in a mark being made on the paper. I'm pretty sure this explanation is accurate, but I wouldn't consider myself an 'expert' in physics. I am an audiophile and a physics nerd, so I'm reasonable confident that this explanation works. Hi Sandy - Under Lead Information in the sidebar there is a link called "Lead Composition". It does indeed wind up looking like plastic. I've been using leadholder the Stadelter 780 for drawing instead of mech pencils but I found a very good source for cheap 2mm lead for leadholders. I picked up a 1,000 pieces I liked it so much compared to regular Stadtler lumograph lead which is kinda hard in the 2-H variety. Well here is a bizarre lead test I performed over the last week or so in my "spare time". I have been curious for some time on the capacity of MP leads in relation to how long they would write for before the inevitable last unuseable last 15mm or so. I had no idea what I was letting myself in for and thought such a test might use up a standard HB 0.5mm lead in about an hour or so of writing. Well the test I performed was to write the upper case alphabet continually until the lead exhausted. RESULTS - Using a Pentel Twist Erase 0.5mm and a Pentel Hi-Polymer HB lead. I might say at this point I gave in after 9 hours worth of solid writing and had still only used 30mm of the lead (there was exactly 30mm left when I gave up. 45,531 thats forty five thousand five hundred and thirty one uppercase letters!!! This works out at more than 68,000 letters for 45 mm useage assuming 15mm non useable. Why did I do it - because as I said above I thought it would only take an hour or so - how wrong could I be. By the way this was the severest test of both the Pentel Twist Erase 0.5 and the Pentel Hi-Polymer. Both performed flawlessly - not one lead break in 9 hours of writing. Needless to say I will remain anonymous as I dont want strange vehicles coming to my house to take me away. Dave and contributors - feel free to call me MAD, you wouldn't be too far wrong. Anonymous, I admire your persistence. So if my calculations are right, it would take 18 hours to use up a lead, right? There ought to be a prize for this. How about the James Cook pencil prize for persistence – as you had set foot where no one has been before The true spirit of the pioneers. Trying to find out, what we all would like to know, but are to lazy or afraid of trying. Good show. Thanks for the encouragement Nate and Henrik. How did I count the letters - certainly not manually. I set up an excel spreadsheet with Vlookup tables to calculate the number of letters on each line (using the first and last letter of each line)- there were 1039 lines in all at an average of 43.82 uppercase letters per line. I'm an ex bean counter so these numbers fascinate me. actually nate it would be more like 13.5 hours to use up a lead because of the loss of the last 15mm or so of lead which is unuseable. This test was very intensive writing so in reality, unless you are drawing and sketching, it would take a lot longer than 13.5 hours to use up a lead. 2B said nate - I'm mad but not that mad!!! cheeky, cheeky, Dave - youv'e exposed your own nerdiness more than once :) - I just took it to a new level thats all. Dave, I agree with Henrik. MAD Anonymous' "Endeavour" is deserving of special recognition. Very good show!!! Just as certain climbs in the Tour De France are "hors categorie" MAD's grittiness is way beyond the ordinary and an inspired contribution to lead lore. But you should still watch your back MAD, the Men In White are always looking to reel in outliers :>))). "Endeavour" = thats good Barrel, good. Well, I agree, MAD showed outstanding Endeavour, as well as staunch Resolution and a sense of Adventure. So, shall we make it official then, and award MAD the inaugural DMP "JC Award for Outstanding Endeavour and Resolution"? Wow, you guys amaze me - not only pencil nerds but James Cook nerds as well. Thanks for the award it will sit proudly somewhere in a WORD file after I have copy and pasted it there. Meanwhile I'll just go sailing right along. Hey MAD, you might be interested to check out this bit of JC'ery. And of course a fellow Yorkshireman indeed. Has lead composition improved with time? Or are advances made such as using polymers only for the purpose of reducing costs? Is there a performance gain with new lead types today? I can't seem to find a source for a very unusual mechanical pencil. Probably not even a year old, originally from Office Depot. Made by Foray and has TM by the name. The diameter of the dark blue and black pencil body is the same as its eraser, which is oval, roughly 1/4" x 3/8". The lead is flat and not round. The idea is like a mini carpenter's pencil. The lead is a little thicker than 5mm and 1/16" wide. Great for calligraphy, sketching, etc. Any ideas on how to track this little gem down? It is sold under many different brandnames by many retailers. I want to ask: Are 2mm leads also ceramic, or are they polymer? Thanks. By the way, fantastic blog. I view it whenever I can. I'm not sure that the acoustic properties of the pencil are really a factor here. The pencil is held in the hand, and flesh is very good at damping vibration and resonance. Just put a finger on a crystal goblet and try to get it to ring to see how well flesh dampens vibration. I would guess that all the sound is produced at the tip of the pencil, as the hard clay particles scratch and rasp across the paper (cellulose) fibers. It might be a good experiment though. You could attach a piece of thin cardboard (perhaps a piece of a manila folder) to the back end of the pencil and see if this added diaphragm increases the amount of sound produced.